When cycling in cold weather conditions, all your body's extremities are at risk of getting cold. Feet in particular tend to feel the chill more than most other parts, because, as you pedal, they're spinning around, which only increases the wind chill factor. One of the best ways to keep your feet warm is to wear overshoes. Overshoes are booties that are made of Gore-Tex, neoprene or nylon, which are designed to be pulled on over shoes. 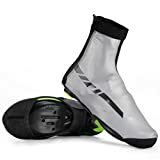 Overshoes are firmly attached to your feet using velcro, and often have little reflective strips on the back, which is of course a helpful safety measure that increases your visibility. Furthermore, you won't lose any of your grip on the pedal, as they even have a cut-out window in the sole. Besides keeping your feet warm when cycling, overshoes also will help keep your shoes dry - essential if you plan to walk around in your shoes all day! 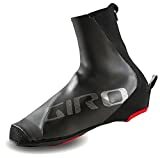 If you ride a road bike with no front mudguard, you've probably noticed water being dumped on top of your feet, so in the case you're sure to find overshoes especially helpful. Overshoes are long-lasting (provided you remember to take them off as soon as you get off your bike), but some people just consider them to embarrassing to wear. If you don't want to wear overshoes, another alternative that you can look at is water-proof socks. Water-proof socks can do a great job of keeping your feet warm and dry, but you should be aware that they are thicker than normal socks, so you need to wear your largest shoes with them. Stay extra warm in the saddle with an extra layer of protection over your feet. 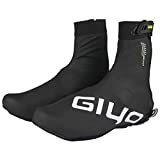 Giro's Proof Winter Shoe Covers are engineered from a water-resistant and wind-resistant super stretch neoprene that is incredibly warm and includes flex zones in key areas to minimize bulk without sacrificing warmth. A locking zipper ensures a secure fit and reflective detailing helps you to be more visible during low-light rides. 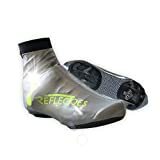 ReflecToes use the latest in cutting-edge BioMotion technology to capture the attention of other road users, cyclists, runners and drivers to make sure you're safe on the roads. Our ReflecToes Fluorescent Reflective Gloves are designed to reflect organic movement. This means that drivers and other cyclists are able to instantly recognize human motion from a distance and react accordingly. The 360° reflective coverage means that whether you're running, walking, biking or hiking - you'll always be visible at night to reduce risk and ensures maximum safety. Our shoe covers make you 100% visible at night, removing the risks associated with low-visibility and night travel! No more risky or sharp turns, as this highly reflective material keeps you safe with a warm radiant glow. Stay 100% happy on your commute with a sealed cover design that's seam taped and ready-for-action in all weathers and climates! The back zipper and Easy Fit Stretch Technology ensure that the covers fit snugly over any type of shoe, boot or sneaker for the ultimate fit. The material is wind-resistant, durable and lightweight, freeing you to focus on the ride. The sole of the shoe is designed to improve grip, power and comfort to improve your performance. As some of our customers feedback us the shoe cover is small for their shoes,so we have tested our overshoes with different sizes shoes,now we have adjusted the size chart, please rest assured to buy. Or we can recommend the right size for you if you don't mind to tell us your shoes size before order. Endura MT500 Mountain Cycling Overshoe sizing is unique and are expected to run a full-size small; Overshoe fits snugly and should be rolled on over shoes to ensure proper fit and protection. The Endura MT500 Mountain Cycling Booty Overshoe II is designed to keep out the elements while standing up to off-road abuse. Made with a nylon-faced neoprene outer for extra warmth and insulation. Full-length zipper down the back provides easy entry for all sizes. Velcro tab across the top of the zipper provides a secure fit. Reflective taping adds visibility when you are training in low light conditions. Molded rubber toe cap with ridged/grooved underside to help when climbing steep and/or muddy slopes. Welded center seam for smooth finish and improved water protection. Sizing (Shoe size): S: 5.5-7, M: 7.5-9, L: 9.5-11, XL: 11.5-13, XXL: 13.5-15. Endura MT500 Mountain Cycling Overshoe sizing is unique and are expected to run a full-size small. Reflective article on the back to keep you safe when riding. Made of windproof PU and Thermal fleece Lining material keep your warm in winter. High strength, good toughness, windproof and make you comfortable when you wear it. There is a piece of Reflective fabric on the heel made cycling overshoes improve night cycling safety. ★Made of windproof PU and Thermal fleece Lining material keep your warm in winter. ★Waterproof design,there is no need to worry about rain or sediment. ★High strength, good toughness, windproof and make you comfortable when you wear it. ★Reflective article on the back can keep safe when you riding. Because there is chromatic aberration depending on the equipment, please be careful. The size is measured by hand and has an error of 1 to 3 cm. Your super-vented, featherweight road shoes are doing a fantastic job of keeping your feet dry, but the mercury has dropped a few steps, and your toes are feeling a little blue. Pull on the Pearl Izumi Elite Thermal Toe Covers and get back to riding. The Elite Thermal Toe Covers are ideal for chilly training rides when full shoe covers are overkill but plastic wrap over your socks isn't cutting it.